Dr. Jerome A. 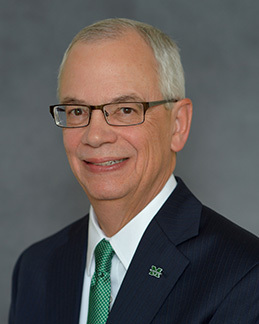 “Jerry” Gilbert was named the 37th president of Marshall University on Oct. 20, 2015. He assumed the presidency in January 2016. A Mississippi native with a background in biomedical engineering, President Gilbert previously served for nearly six years as provost and executive vice president of Mississippi State University. Before that, he was the university’s associate provost and associate vice president for academic affairs for six years. Earlier roles include head of the Department of Agricultural and Biological Engineering and coordinator for the biomedical engineering graduate program in the Bagley College of Engineering. President Gilbert attained the rank of professor in 1993 after joining the Mississippi State faculty in 1988 as associate professor. From 1989-2005, he also served as adjunct clinical assistant professor of orthopaedic surgery (research) for the University of Mississippi Medical Center. He served for 10 years as a research affiliate with the Institute of Neurocognitive Science and Technology at Mississippi State, and was among the first class of Mississippi State’s honors faculty in the Shackouls Honors College. President Gilbert was a graduate assistant at Duke University and held previous academic appointments at North Carolina State University and University of North Carolina (Chapel Hill) School of Medicine.